Most of our products are easy to customize online with our fun tool, If you require more advanced help with design we have professionals available to make real that design you have in mind, just Contact Us thru the menu on the top and we will do our best to give you the best service we can. Let your imagination fly and Create an amazing design online it will be printed in a professional made Custom Vinyl Banner. Excellent For Events or to Display big messages or Increase Sales! Colors will not fade in the sun or rain (up to 2 years), is an excellent indoors outdoors sign for the best price in USA! This banner will be finished with silver metal Grommets and strong hems, ready to hang ! After receive your artwork, we will print and ship your banner FOLDED in an expedite shipping package so you can have it FAST & FREE at your door in 4 to 8 BUSINESS DAYS! Want to save more ? Send a ready to print file! we have that option too, just click in the shop link at the top of this page. Design Your Banner Online ! 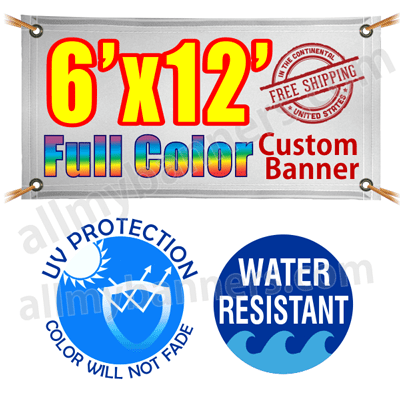 Purchase this vinyl banner and use our online design tool for free ! Receive your banner in 4 to 8 Business Days or even less !